^ Colvin, H. M. Colvin (1954). A Biographical Dictionary of English Architects, 1660-1840. Harvard University Press. pp. 357. ^ Roth, Leland M. (1980). A Concise History of American Architecture. Westview Press. pp. 67. ^ a b Roth, Leland M. (1993). Understanding Architecture: Its Elements, History and Meaning (First ed.). Boulder, CO: Westview Press. pp. 117-8, 415. ISBN 0-06-430158-3. ^ Semmes, John Edward. John H. B. Latrobe and His Times, 1803-1891. Baltimore: The Norman Remington Co., 1917. Addison, Agnes (July 1942). “Latrobe vs. Strickland”. The Journal of the Society of Architectural Historians 2(3): 26-29. Burchard, John; Albert Bush-Brown (1966). The Architecture of America: A Social and Cultural History. Little, Brown. Carter II, Edward C. (1971-1972). “Benjamin Henry Latrobe and the Growth and Development of Washington, 1798-1818”. Records of the Columbia Historical Society. Crook, Joseph Mordaunt (1972). The Greek Revival: Neo-Classical Attitudes in British Architecture 1760-1870. John Murray. ISBN 0719527244. Donaldson, Gary A. (1987). “Bringing Water to the Crescent City: Benjamin Latrobe and the New Orleans Waterworks System”. Louisiana History (Louisiana Historical Association) 28(4): 381-396. Dumbauld, Edward (1980). “Thomas Jefferson and the City of Washington”. Records of the Columbia Historical Society 50. Fazio, Michael W.; Patrick A. Snadon (2006). The Domestic Architecture of Benjamin Henry Latrobe. The Johns Hopkins University Press. Fazio, Michael W. (September 1989). “Benjamin Latrobe's Designs for a Lighthouse at the Mouth of the Mississippi River”. The Journal of the Society of Architectural Historians 48(3): 232-247. Formwalt, Lee W. (1980). “Benjamin Henry Latrobe and the Development of Transportation in the District of Columbia, 1802-1817”. Records of the Columbia Historical Society 50. Formwalt, Lee W. (October 1977). “An English Immigrant Views American Society: Benjamin Henry Latrobe's Virginia Years, 1796-1798”. The Virginia Magazine of History and Biography (Virginia Historical Society) 85(4): 387-410. Formwalt, Lee W. (1979). Benjamin Henry Latrobe and the Development of Internal Improvements in the New Republic, 1796-1820. Ayer Publishing / Catholic University of America. Frary, Ihna Thayer (1969). They Built the Capitol. Ayer Publishing. ISBN 0836950895. Hamlin, Talbot (1955). 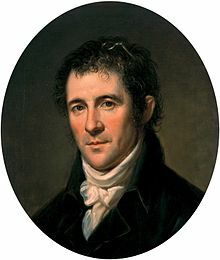 Benjamin Henry Latrobe. Oxford University Press. Hamlin, Talbot (1944). Greek Revival Architecture in America: Being an Account of Important Trends in American Architecture and American Life Prior to the War Between the States. Oxford University Press. Kennedy, Roger G. (1989). Orders from France: The Americans and the French in a Revolutionary World, 1780-1820. Alfred A. Knopf. ISBN 0394555929. Kimball, Fiske (1922). 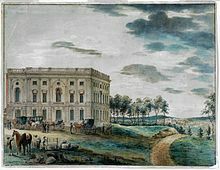 Domestic Architecture of the American Colonies and of the Early Republic. Charles Scribner's Sons. http://books.google.com/books?id=QckVAAAAYAAJ. Latrobe, Benjamin Henry (1905). The Journal of Latrobe. D. Appleton & Company. Norton, Paul F. (June 1951). “Latrobe and Old West at Dickenson College”. The Art Bulletin 33(2): 125-132. Norton, Paul F. (1977). Latrobe, Jefferson, and the National Capitol. Garland Pub.. ISBN 0824027167. Peterson, Charles E. (December 1953). “Early Prisons”. The Journal of the Society of Architectural Historians 12 (4): 26-31. Stapleton, Darwin H.; Edward C. Carter II (September 1984). “"I have the itch of Botany, of Chemistry, of Mathematics...strong upon me": the Science of Benjamin Henry Latrobe”. Proceedings of the American Philosophical Society (American Philosophical Society) 128(3): 173-192. Summerson, John (1993). Architecture in Britain, 1530 to 1830: 1530-1830. Yale University Press. ISBN 0300058861. Tatum, George B. (1961). Penn's Great Town: 250 Years of Philadelphia Architecture Illustrated in Prints and Drawings. University of Pennsylvania Press. Woods, Mary N. (2004). “Chapter 6, The First Professional: Benjamin Henry Latrobe”. In Eggener, Keith. American Architectural History. Routledge.